I found this song through LastFM. I LOVE it. Hot track. Just have no idea what they are saying besides the reference to the X-Files! Primal Blueprint 30 Day Challenge – Are you in with me? I’m a follower on Mark Sisson’s blog (Mark’s Daily Apple) and recently purchased both The Primal Blueprint and The Primal Blueprint Cookbook. I have even started to cut out grains in my life, but the pizza is something that is a hard habit to break (queue Peter Cetera). I am really buying into the concept that we should be eating/living like our ancestors from the Paleolithic era. I totally believe that our complete manufacturing of food in this country is the cause of our ridiculous percentage of overweight/obese Americans. Here’s where you come in. I want you to do it with me. I want you to post pictures/starting weight, and also post pictures/ending weight with me. Are you down? Do you accept the challenge? Post in the comments here, and/or go to the Facebook event I created. This whole album is hot! I’m not a Jay-Z fan at all, but really get into this album. This is track 3 and my favorite. I get hype when it comes on, and wish I could play it at my Tuesday class (too much cursing to allow it tho). Check it, then buy the album! 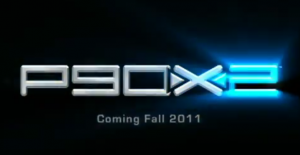 Head on over to http://www.coachfoland.com to pre-order P90X2. By pre-ordering, you get free shipping (in time for Dec 25, 2011), 2 one on one DVDs, and your chance to have it delivered personally by Tony Horton himself. You can order three different package options, as well as the option to purchase in Blu-Ray format! If you do not pre-order, you may not be able to get it until Feb 2012!!! So order from me today. I have been loving this song. Not a big Lupe fan, but I do like some Trey Songs (who sings the chorus). Fun Song. If you haven’t done P90X yet, go get it at http://www.coachfoland.com so you can be finished with it and ready for P90X2 when it comes out this Fall.